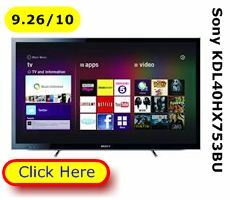 Compare 40 inch TVs 2013- UK – at a glance - from the no-nonsense LG 42LS5600, through the budget priced Samsung UE40EH5000, to the sophisticated Sony KDL40HX753BU (a 3D-ready and SMART 40 inch LED TV). 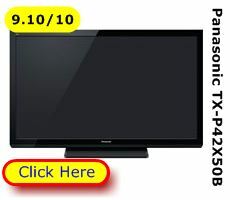 There’s a top rated 40” HD-ready TV to suit the needs of simple high definition TV watching with maybe a DVD attached through to a home hub with the TV at its centre linking in PVRs, games consoles, cameras, PCs and even your Smart phone, too. We’ve surveyed 1,910 individuals who’ve owned and used their 40 inch TV for at least 6 weeks or more before participating in our research. Use our comparison tables to judge for yourself which TV model is the best buy for you. Which 40 inch TV is best at delivering a great, pin-sharp high definition picture, reasonable sound quality and easy connections to TV aerials, cable or satellite TV, Freeview, peripheral boxes like a PVR and all at a price to suit your budget? Use our Compare 40” TV table to find which model HD-ready LED TV will suits your viewing, listening, playing and surfing needs. There are economy models that offer high-definition viewing pure and simple. Then there are advanced models that offer 3-D TV and film viewing. There are also Smart TVs that come with their own – sometime wireless – links to the internet. These 40” Smart TVs have plug and play aids that help you display images from your PC, camera, games console and many other devices – including smart phones. Our 40 inch TV comparison table helps you home in on the LED, Plasma or LCD set best suited to your needs and budget. A model comparison lets you compare and contrast one television against another across the current top 10 models available in Britain today. Whose top 10 is this? The answer is an owners’ top 10. At Best Buys for we publish consumer reports based on surveying owners who have used their 40 inch LED TV for at least 6 or more weeks. That’s long enough to get over snazzy designs or super picture quality and determine whether your high-definition telly is easy to set up, has all the connectors you need now and in the future, offers plug and play simplicity and sounds reasonably good, too. The top, user-rated models are on the left beginning with the LG 42LS5600. Then you can look down the columns to locate the functions you need in a 40 inch LED TV – like high definition, 3-D picture display or smart TV functions. We reckon you want to quickly target the best high definition televisions – so we feature here only the top 40 inch TVs – not the also-rans. To date we’ve surveyed over 1900 users of forty inch televisions in order to find out which are the best buy models in the UK and why. One question we asked was: “You’ve lived with your television now for 6 or more weeks. Thinking about how much you paid and your experience to date, how would you rate your TV overall out of 10? We combined all marks for a given model to find the overall users’ rating. 8 or more suggests a 40 inch LED TV that delivers a great picture, reasonable sound and easy connectivity to peripheral devices – like a PVR or DVD player. It’s also reliable and represents good value for money. A rating of 7 or less suggests a TV model has shortcomings in performance or reliability and has been judged – by users – to be poor value for money. Prices were correct at the time of publication. LCD TV screens with compact fluorescent tubes are light-weight and reasonably compact (compared to a bulky, old-fashioned CRT TV). But even LCD screens can be improved on. 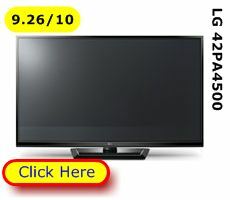 An LED-TV is an LCD flat panel lit by tiny LEDs (Light Emitting Diodes). That makes the TV flat panel even thinner, lighter and more energy efficient. 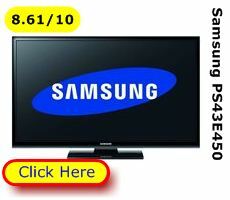 The latest high definition, 3D and SMART TVs are all 40 inch LED TVs. A Plasma TV uses inert (harmless) gases to generate light & colour. You can get a better television picture with more vibrant colours. And Plasma 40” TVs don’t suffer from motion blur like some cheap LCD TVs. 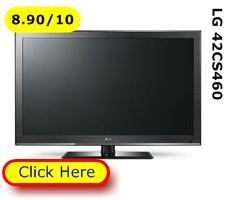 The disadvantage is a Plasma TV generates more warmth and uses slightly more energy than an LCD or LED TV. A 40 inch 3D-Ready TV is capable of displaying 3D images from a 3D television broadcast or from a 3-D enabled peripheral device playing a 3D DVD or Blu-ray disk. Right now there isn’t much 3D-TV broadcasting around. So a 3-D TV will detect the type of TV signal and happily display standard high-definition broadcasts. Most 3D-TVs require you to wear a pair of 3-D specs to enjoy the three dimensional qualities of a 3D broadcast. You don’t wear these specs for ordinary, everyday programmes. Most manufacturers provide a bunch of 3D-specs in the TV’s box. Some manufacturers will have you buy the glasses as an additional purchase. A SMART TV can display a variety of images, not just TV programmes or video from a DVD or personal video recorder. Depending on the connections on the back or side of the TV panel you can often display your photographs, play home videos, and play the radio, stream music from your MP3 player or digital HiFi. You can also connect up your computer and use your 40 inch TV as a computer display monitor. 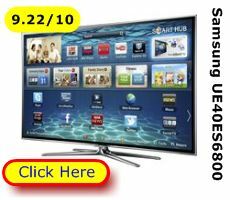 Additionally a SMART TV is like a smart phone, it can – using the internet – do more than simply play in-home material. You can access the internet. Now, accessing the internet through a SMART TV can vary from a manufacturer’s proprietary internet or cloud channel through to full blown access to the world-wide web. What you can do depends on your 40 inch SMART TV’s spec and/or your broad band connection. With a manufacturers proprietary internet cloud channel you will probably be limited to particular web locations like Facebook and Twitter. You may also be able to download (using the TV remote and red button type functions) “Apps” to play or use on the TV screen and to stream content – like a pay per view movie. With full-blown access to the web, you can go anywhere on the web via Google or another search provider. You might have to use the manufacturer’s installed web browser, e.g. Opera and you may only be able to Skype if the TV is pre-enabled. Full-blown SMART TV web-access requires you to have a broadband subscription and connection and have your 40 TV plugged into the broadband connection. You can do that by an Ethernet or wireless connection to your network or broadband router. Or you can plug the broadband modem connection directly into the back of the SMART TV. You may find full blown web-access frustrating because a SMART TV doesn’t necessarily come with a keyboard. You’ll have to buy that separately and plug it into the side or back of the TV. (Check out DLNA compliance below). Media remote indicates you can download an Android or i-Phone App to convert your mobile into a TV remote control. 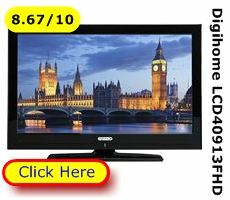 An HD-Ready TV is one that can display high definition TV programmes. A 720p HD resolution will seem acceptably sharp. It’s roughly half as good as a full-HD “1080p” resolution. The TV picture fills the entire screen. The TV has built-in software that detects the TV programme’s format and adjusts the display ratio automatically to fill the TV screen. Without this function some programmes will be displayed in 4:3 format with black margins to right and left. At “normal” motion picture rate of 25 frames per second or “50Hz”, some LCD and LED TV screens have difficulty resolving fast motion in some circumstances, e.g. a football arcing towards goal. The image may seem fuzzy or smeared. To overcome this, possible, problem manufacturers have tweaked the picture frame rate on their models. This is called Motion Processing and is expressed by the Motion Clarity Index or MPI index. 50Hz MPI is “normal” motion picture rate or around 25 frames a second. 100Hz is twice the rate, 150Hz three times and so on. Some manufacturers claim an index of 400Hz in some circumstances on their TV models. A high MPI index will be beneficial to people connecting their TV up to PC or games console or HD Blue-Ray movie players. It’s worth noting that Plasma TV screens don’t have the – occasional - motion blurring problem. The TV model is sufficiently smart to automatically detect a digital broadcasting input signal, then download and store the channel information without any faffing by you - the viewer. The TV has a built-in Freeview tuner. 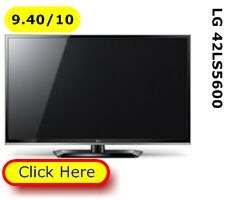 You need to check the Freeview on offer is Freeview HD otherwise you won’t be able to view HD on your HD-ready TV. An EPG will display information about the programme on view, what’s coming up next and may also set reminders for programs you don’t want to miss. Clear voice adjust is a way of getting voices to stand out from the background noise or music in a TV broadcast. It may be helpful for people who are hard of hearing. There isn’t much heft in a modern TV screen to give a bit of beef to the sound produced. In most circumstances you’ll find sound is quite acceptable. However, if you like the sound turned right up, or you play computer games or watch action movies you may find the sound experience a bit “tinny”. Even with multi-mode Dolby. Sadly, the only way to overcome the problem is to connect the TV to a Sound-bar, separate speakers or a home cinema rig. In most cases you’ll play MP3 music by connecting your player to the TV or by inserting a USB pen drive. A few 40 inch TV models have SD card slots. All have a USB slot into which you can insert a USB pen drive with your photos on board. The majority of models in our 40 inch TV survey can take on the role of PC monitor and/or games console monitor. Digital Living Network Alliance. This mark suggests that – in theory – this TV model can accept connections from other digital devices on a plug and play basis. We all need sockets to connect up the humble DVD player or wire in a games console or whatever other menagerie of devices we want to play back through the TV screen. VESA is a standard specification for slots and connectors in the back of the TV flat panel so you can hang the TV securely on the wall or a pivoting arm. To build our compare 40 inch TVs tables, we surveyed 1,910 owners and solicited their views and experiences of TV ownership. When you’ve compared 40 inch TVs you may want to take advantage of our other service: Tracking down the right 40 inch 3D or 40 Inch SMART TV at the right price from a reliable and prompt delivering retailer. Take a good look at our price research tables where you can compare prices and snap up the best bargains and cheapest prices on the Best Buy for 40 inch LED television in Britain today. 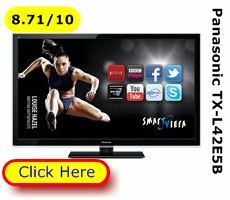 Find out, today, which sleek, high definition TV is best for your viewing and connecting needs. Save money, on a family media centre today. A modern TV uses less power than those of yesteryear. 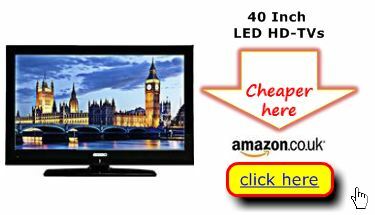 An up to date high definition 40 inch LED TV also offers viewing, listening and playing opportunities for years to come. 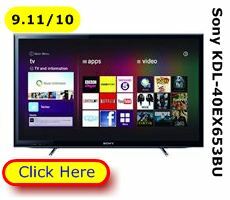 Top 40 Inch TV | Which 40 inch LED TV is best?